For the afternoon break-out session of the 2012 Oregon NAME (National Association for Multicultural Education) Conference I attended a session titled The Role of Culture in Interactions and Communication, presented by Weiwei Zhang and Chris Ward of Oregon State University. 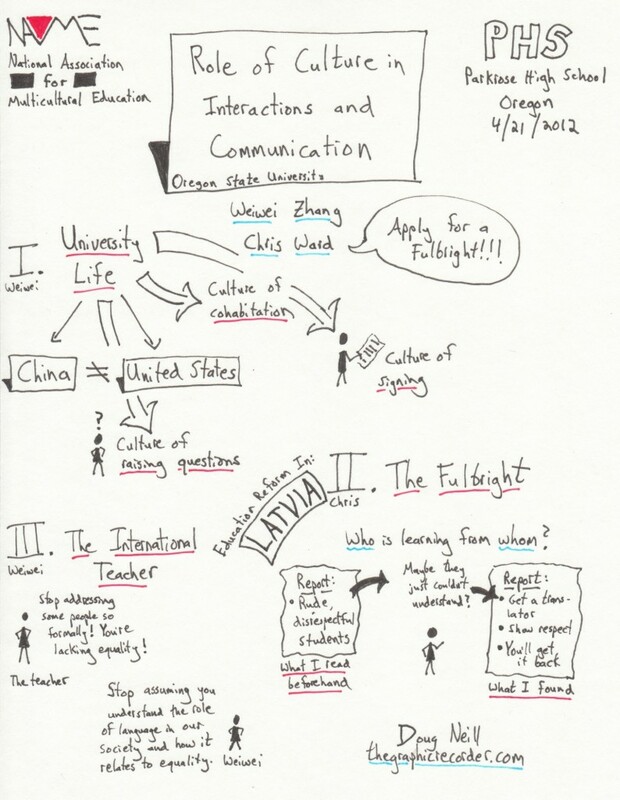 The sketchnotes above capture the three stories that the presenters told to help illustrate their thesis – that taking culture into account is in fact very important when interacting and communicating with others. Each story had a personal touch because in each case one of the presenters was a main character. In the first story Weiwei described a crisis that arose while studying abroad here in the U.S. due to a miscommunication and differing cultural implications of signing your name to a piece of paper. In the second, Chris talked about her Fulbright-funded experience with education reform in Latvia. In the third and final story, Weiwei demonstrated both her fluency with the English language and her willingness to combat cultural infringement by a foreigner who assumed he knew enough about Chinese culture to critique it. These three stories effectively demonstrate the impact that culture has on interactions and communication. They also highlight the need for teachers to be aware of that impact so that they can gracefully and respectfully manage classrooms that contain students with beautiful and invaluable cultural differences.